The Earth may well want Sea of Bones dead; although upon listening to this gargantuan album it would appear that they want the Earth dead. This being my introduction to the Connecticut three piece, I’ll admit to not knowing what quite to expect. The accompanying press release called them “atmospheric doom metal miscreants” and that by no means does this album justice. The first thing you should know is that The Earth Wants us Dead is a staggering 92 minutes in length, with a good chunk of that time taken up by the closing title track, which clocks in at 39 minutes. So, you are going to want to set aside some serious time for this animal, and you might want some medication to accompany that time, as this is bruising stuff. The Earth Wants us Dead is an excursion into filthy distorted guitars, vocals from the abyss and intent to strip the very will to live from you. 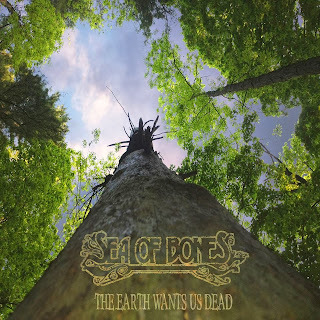 There’s doom metal, and then there’s Sea of Bones, as each of the six songs here, aside from the title track, will demolish your very core as they take misery to a new level. The title track, which is no less crushing, is an exercise in instrumental brutality, with its droning ambience. Seriously though, by the time you have made your way through the first five tracks you will need a little respite. Whether or not you get that respite will depend entirely on how you fair during the preceding 50 minutes or so, as Sea of Bones spit forth their vitriolic misery. To say that this is a heavy album would be a disservice, as not only does the music crush, but it also delivers an atmosphere of sheer and utter hopelessness throughout its running time. You certainly aren’t getting easy listening here, although if you’re a fan of such bands as Grime or Primitive Man you are going to dig this. Personally I thought it was terrific, in a soul-destroying way, and I look forward to having my will to live surgically re-attached in the near future. You have been warned; Sea of Bones will hurt you. The Earth Wants us Dead is released later this year (no release date as yet). For more news check out their Facebook page.